During the Second World War, Gaza was an Australian hospital base and the AIF Headquarters were posted there. Among the military hospitals in Gaza were 2/1st Australian General Hospital, 2/6th Australian General Hospital, 8th Australian Special Hospital and from July 1943 until May 1945, 91 British General Hospital. There was a Royal Air Force aerodrome at Gaza, which was considerably developed from 1941 onwards. 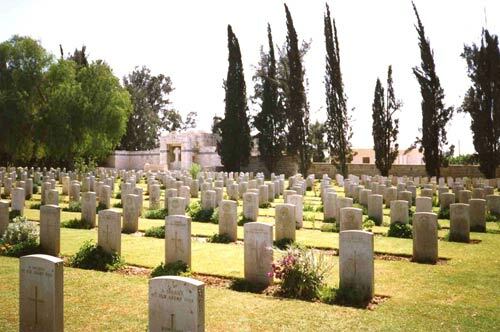 Gaza War Cemetery contains 3,217 Commonwealth burials of the First World War, 781 of them unidentified. Second World War burials number 210. There are also 30 post war burials and 234 war graves of other nationalities. This cemetery was in recent years a number of times severely damaged by bombings. Many gravestones became irreparably damaged.